In the beginning of February, an annual traditional event called setsubun is held in several temples and shrines in Kyoto. It is the ceremony to drive away the demons which are said to appear when the seasons change. Bean-throwing, while chanting “Oni wa soto, fuku wa uchi” (out with the demons, in with good luck). Start at 13:00 on 3rd by demons and yamabushi(mountain ascetic). Sweet amazake is served. Take Kyoto City bus no. 206, 201 and 203 and get off at Higashiyama-marutamachi bus stop. Traditional performance by maiko and geiko will be held at 9:00 on both 2nd and 3rd. Sweet amazake is served. Take Kyoto City bus (Raku Bus 100) and get off at Gion. This shrine is famous for the thousands of red Shinto gates. The throwing beans event will be held at 11:30 and 13:00 on 3rd. Take JR line from Kyoto Station and get off at Fushimiinari Stn. This shrine enshrines the God of Sake. You can see some demon (people wearing demon costumes, photo above) dance on the stage. After the demon’s dance, the throwing beans event will be held at 13:30~ on 3rd. Some demons threaten the people with an exaggerated gesture at 18:00~ on 2nd. 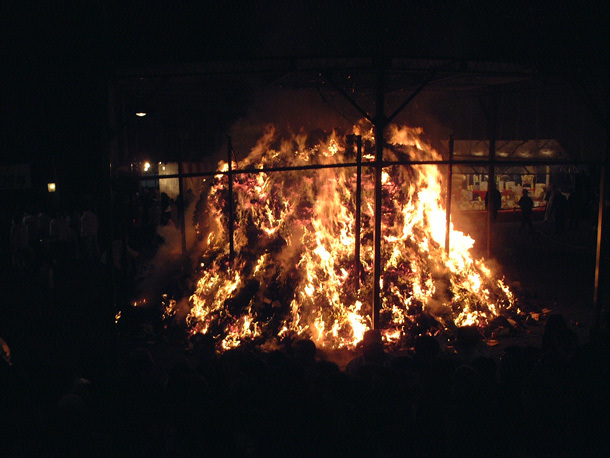 The fire festival as the climax of the event is held at 23:00 on 3rd. About 800 booths line the approach to the shrine’s gate on these two days, so you can enjoy both a traditional ritual and a festive atmosphere. Take Kyoto City bus no. 206 and get off at Hyakumanben bus stop. The famous “Mibu-kyogen” which is a unique performance like a pantomime, but is very sacred, will be held eight times on both 2nd and 3rd. It starts at 13:00. Free charge. Take Kyoto City bus no.26 and get off at Mibuderamichi bus stop. This shrine is located on the west of Imperial Palace and enshrines Wake-no-Kiyomaro. 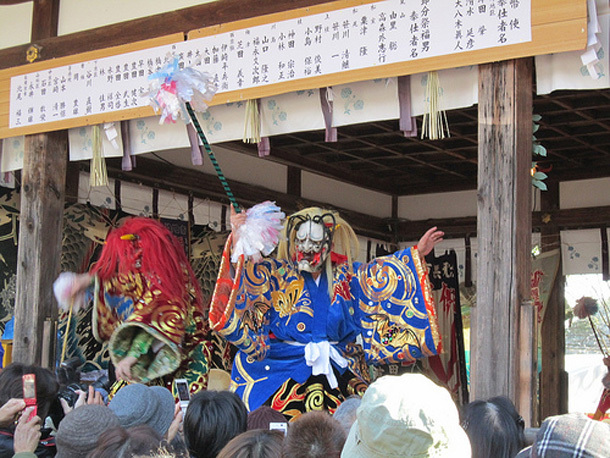 On February 3rd, Setsubun ceremony is held and then beans are thrown to visitors from around 14:00. 10 minute walk to the north from subway Marutamachi Station. This is a rustic old shrine located on the route of Kyoto Circuit Trail. It is said that passing through Ama-no Iwato gate on the shrine ground during Setsubun day let you purify and happy. The location and the hiking route is here: http://www.greentour-kyoto.net/green_east04.html. Driving away demons from my mind? journal Kyoto Feb. issue come out!